Partly cloudy skies this morning will become overcast during the afternoon. A stray shower or thunderstorm is possible. High 76F. Winds SSE at 10 to 20 mph.. Scattered thunderstorms. Low 47F. Winds NE at 10 to 20 mph. Chance of rain 50%. South Dakota State University has long been known for its agricultural heritage. On March 20, the College of Agriculture, Food and Environmental Sciences (CAFES) will celebrate its Ninth Annual Campus-Wide Ag Day. This year’s theme, Rooted in Agriculture, invites people to share what keeps them connected to the agriculture industry. The celebration of agriculture starts with an employer panel on Tuesday, March 19 at 5 p.m. in the SDSU Student Union Lewis and Clark Room. Ag Day officially begins Wednesday, March 20 with CAFES clubs and organizations hosting booths about agriculture in the SDSU Student Union from 10 a.m. to 2 p.m. Additional club-sponsored events will be held throughout the week. The main event, a banquet meal followed by keynote speaker Donna Moenning, begins at 5:30 p.m. on March 20 in the Volstorff Ballroom of the SDSU Student Union. The banquet is free and open to the public. Public interest in food and farming has never been greater. People want to know who is producing their food and how it is being produced. Moenning, an SDSU alumnus who has spent three decades in food and agricultural communications, will share how to respond to consumers’ questions in meaningful ways. Moenning currently works for the public relations agency Look East, working with food and agriculture clients, including The Center for Food Integrity. In her career, she has been director of public relations for the National Live Stock and Meat Board in Chicago and senior vice president of Integrated Communications at Midwest Dairy Association. She has also enjoyed 10 years of work in radio as a farm broadcaster and morning news-talk host in Rochester, Minn. Moenning lives on a crop and livestock farm with her husband and three children in southeast Minnesota. Additionally, donors help sponsor free t-shirts that are distributed for SDSU students to wear on Ag Day. 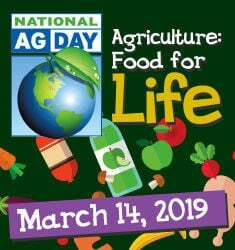 “I always look forward to Ag Day when around 2,000 people on campus are wearing the same t-shirt in support of our event and the agriculture industry,” said Krista Fuoss, president of the CAFES Prexy Council. Ag Day is organized entirely by the CAFES Prexy Council, which is the student-led governing body of CAFES clubs and organizations.